Dennis Keith Rodman was born May 13, 1961 in Trenton. His father abandoned Dennis and his two sisters in 1964, leaving his mother, Shirley to raise three kids as a single mother. Eventually, she moved the family to Texas. As a boy, Dennis was very skinny and often picked on by bigger kids. He was unable to make the varsity basketball squad at South Oak Cliff High School, and was eclipsed by his sisters, who were both standout players there. After graduation his mother issued an ultimatum—join the military, go to college or get a job. Dennis chose to attend Cooke County Junior College in Dallas. When he enrolled he was not quite six feet tall. After an amazing growth spurt, he stood 6-7, with freakishly long arms. Dennis wasn’t particularly coordinated, but he had played enough pickup basketball as a teen to become a very good rebounder and defensive player. Unfortunately, after one year with Lions, Dennis flunked out. A scout from Southeastern Oklahoma State, an NAIA school, had seen Dennis play and thought he was worth gambling a scholarship. He joined the Savages for the 1983–84 season. Dennis’s game improved steadily. He eventually grew to 6-8, although he never weighed more than 220 pounds. Nevertheless, he became one of the nation’s top rebounders as a junior and senior. In the 1986 NBA Draft, the boy who couldn’t make his high school team was taken by the Detroit Pistons in the second round. He saw plenty of minutes during the team’s championship seasons of 1988–9 and 1989–90. In 1990 and again in 1991, Dennis was named NBA Defensive Player of the Year. His ability to wiggle between the league’s widebodies and grab rebounds earned him the nickname The Worm. 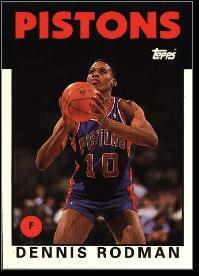 In 1993, with the Piston dynasty on the wane, Dennis signed a free agent deal with the San Antonio Spurs. He was the NBA’s top rebounder three years in a row with the Spurs. During his time in San Antonio, Dennis began experimenting with different hair styles and colors. He dated Madonna briefly and was married to Carmen Electra. In 1995, Dennis was traded to the Bulls. He teamed with Michael Jordan and Scottie Pippen. They won three NBA championships in a row. After Jordan retired, the Bulls waived Dennis. He caught on with the Lakers and Mavericks during parts of the next two seasons before retiring at the age of 39. He ended his pro career. He had been named to the NBA’s All-Defensive First team seven times. He also led the league in rebounding seven times. His job these days is being Dennis Rodman. The “character” he created during his NBA career transcended basketball and has led to a busy career of personal appearances, including a memorable stint as a pro wrestler and several reality TV jobs. In 2011, Dennis was inducted in the Basketball Hall of Fame.